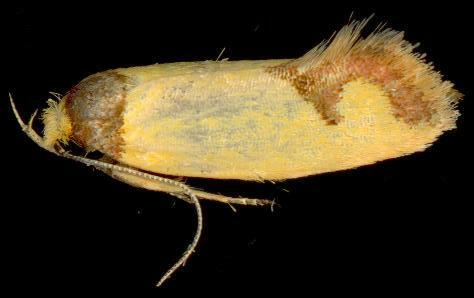 The adult moths of this species have yellow forewings, each with a brown 'U' shaped mark at the tornus, and a brown band at the base. The hindwings are pale brown darkening toward the margins. The wingspan is about 1.5 cms. CSIRO Publishing, Melbourne 1994, pp. 289-290. Part 29, British Museum, 1864, p. 685.